Occasionally we will be sharing Brethren mission stories from around the globe. Today we share a chat with Dave Martin, coordinator of The Timothy Project, about a powerful story he heard from “on the ground” in the mission field. Over the past two years, the Central African Republic has been fraught with violence and unrest due to a government coup, civil war, and social strife. It is also home to more Grace Brethren churches and church members than any other country in the world. Because of this, there is a great need for pastoral and leadership training for the growing churches in the country — most people in the villages there do not have access to anything beyond a basic education. And, though there are also great humanitarian needs in the country as well, both the Brethren church leaders there and leaders at Encompass World Partners have determined that along with humanitarian aid, education, and Bible training are vitally important. 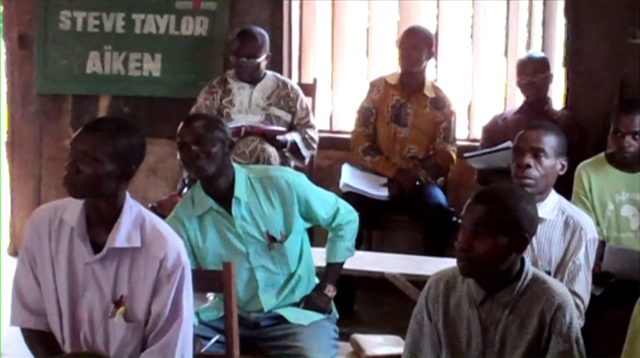 In the fall of 2013, the director of the Bossangoa Bible Institute, a man named Sylvain, participated in trauma-healing workshops offered by Dr. Augustine Hibaile, a leader of the church in CAR. He did so in hopes that he would better be able to minister to students and church members who were facing severe loss. Little did he know that in a matter of months, tragedy was about to strike even closer to home. Early one morning last September, Sylvain’s father’s village was raided by Séléka rebels. As he ran out of the house towards the safety of tall grass on the outskirts of the villages, Sylvain’s father was shot and killed along with 30 others from his village. “Sylvain was devastated,” notes Martin, who heard the story from Janet Varner, who served as an Encompass missionary in Africa and the Central African Republic for over 30 years. But God was also at work. The trauma training that Sylvain had undergone to help others played a key role in his own healing process. The Timothy Project is touching lives and churches throughout the CAR as God works in the country despite the violence and unrest. Find out more about The Timothy Project (and how you can sponsor a family or pray) by clicking here. Click here to send a note of encouragement to Dave Martin and here to send a note to Janet Varner.